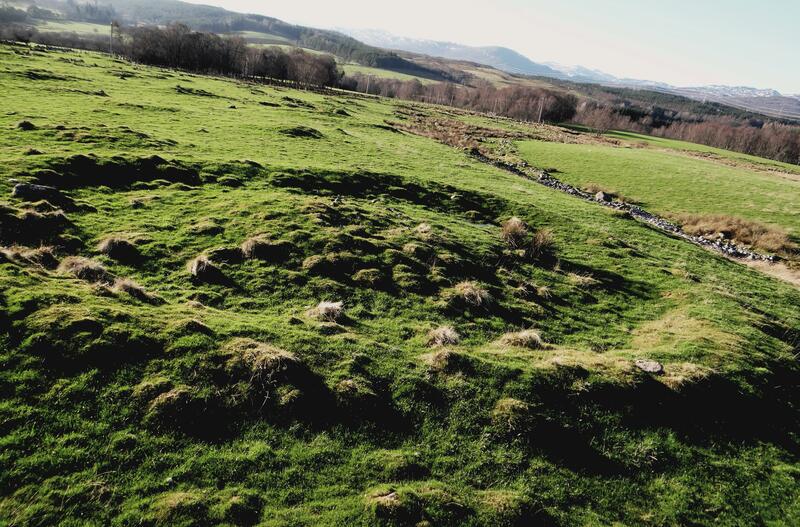 Buntait, Glenurquhart: A Bronze Age Landscape? The larger barrow at Buntait – feature ‘X’ on the map below. Although I have lived in Glen Urquhart for some years, it was only comparatively recently that I first visited Buntait, a hamlet just to the north of the Clava type chambered cairn at Corrimony. This was despite me hearing from a number of local people about the amount of upstanding archaeology that was there. I think I must have presumed that because there are no scheduled monuments there it could not be that interesting – an assumption I will not be making in the future. 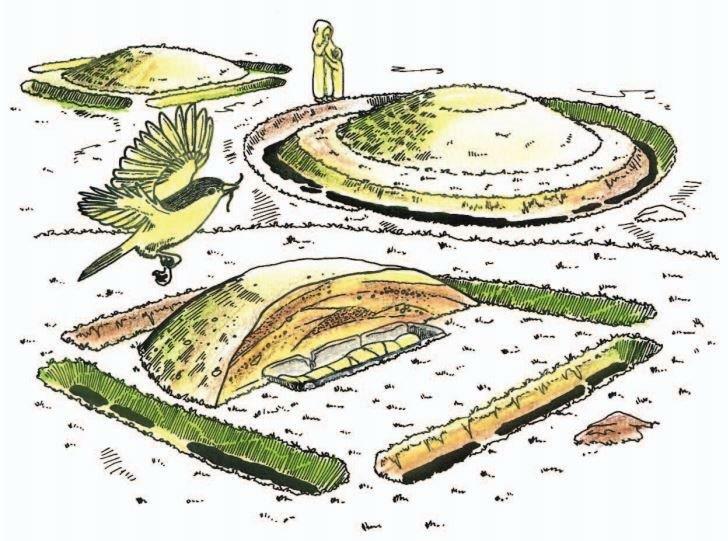 Later research confirmed that Buntait is in fact full of prehistoric (and post medieval) features – including hut circles, field systems, burnt mounds and rock art. 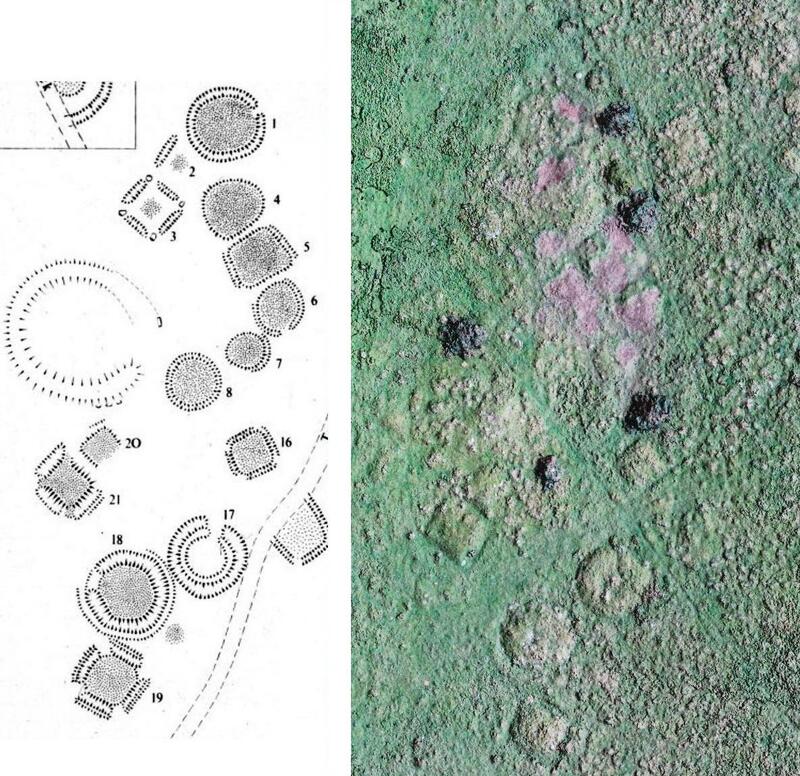 Not only are the field systems extensive and some of the hut circles very well preserved, but also there are a couple of ditched barrow features. Locally, only Garbeg is comparable in terms of prehistoric remains. 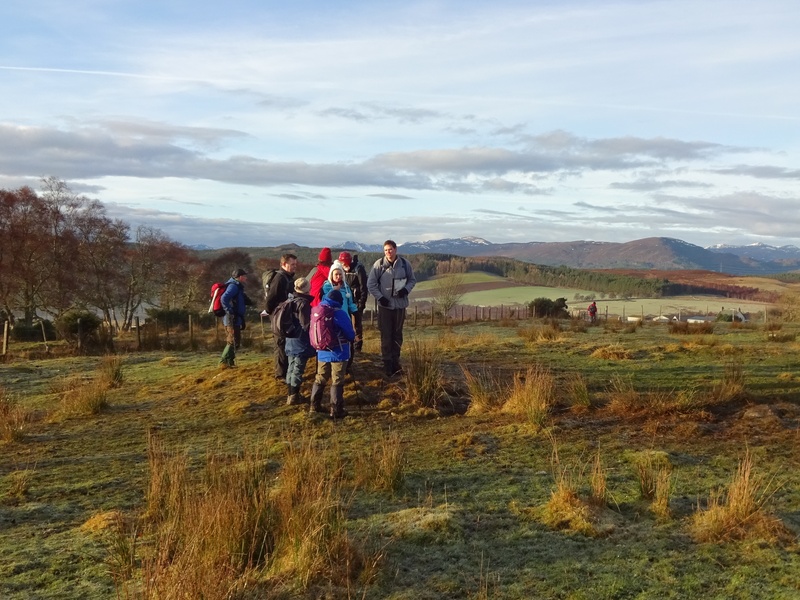 Consequently Buntait became the subject of three archaeological field trips in 2017; two led by NOSAS, and one as part of the Archaeology Scotland Summer School planned with the assistance of NOSAS. There were also numerous smaller sorties for quadcopter flying, polecam photogrammetry, rock art recording (for SCRAP) and general investigation. 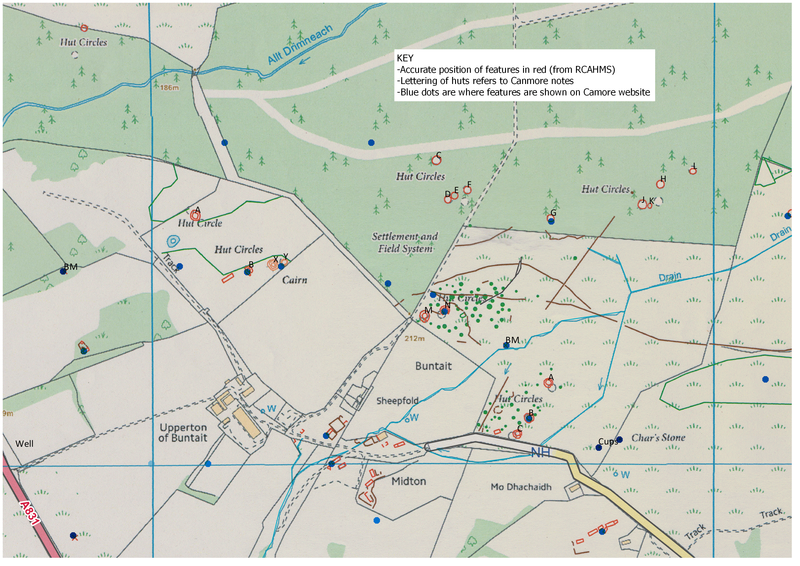 OS map of Buntait annotated with huts, barrows and buildings in red, cairns in green and dykes in brown. Blue dots show the location of records on Canmore. BM = burnt mound. Not far from the Corrimony Burial Cairn, on Buntait lands, was a settlement of some considerable size where clearly marked hut circles and cairns suggest a community practising primitive agriculture and a boundary wall, which can still be traced, may have served to protect domestic animals from prowling wolves or other marauding wild animals. Some of these circles are 30 feet in diameter and in the centre of at least one, is a depression which may have been a ﬁreplace. These circles are low banks of stones covered with grass or heather about 2 feet high and 4 feet wide at the base. It is difficult to imagine one large roof covering such an expanse, but if so, it would probably have been formed of wattles and thatched with heather or turf, giving, when complete, a dome – shaped appearance. In each case there is a break in the circle at the south east which indicates the entrance. In other parts of Scotland where these structures have been carefully examined, hearth paving stones have been discovered, but we are unable to reconstruct much of the everyday life of the people of these long bygone days, and we can merely conjecture that they combined hunting with their primitive agriculture, for the Highlands were rich in wildlife. This entry was posted in Bronze Age, General Archaeology, Loch Ness, Aird and Inverness, Surveying and Recording and tagged A Bridge to the Past, Achany Glen, Alastair MacKell, archaeology 3d Model, archaeology highlands, barrow cemetery, bowl barrow, Bronze Age Archaeology, Bronze Age barrows, bronze age farming, bronze age hut circles, Buntait, Chars Stone, Corrimony chambered cairn, cup marked stones, Drone, Garbeg, Glenurquhart, Highland Archaeology Festival 2017, holy well, hut circles, Hut circles in forestry, Monie's stone, North of Scotland Archaeological Society, Northern Picts, Peter English, photogrammetry, photogrammetry cup marks, pictish barrow, pictish cemetery, Prehistoric field systems, quadcopter, RCAHMS, rock art, Scotland’s Rock Art Project, St Curadan, St Curadans Well, The Glenurqhuart Story, Urchany bowl barrow, William Mackay Urquhart and Glenmoriston on March 20, 2018 by nosas. The Pictish people of the mid to late first millenium AD once inhabited what is now northern and eastern Scotland. They left very little written record and the evidence of buildings so far identified are sparse. Perhaps their most obvious remains in the landscape are the enigmatic symbol stones and the imprints of their burial sites. Although modern Angus and Perthshire have traditionally been seen as the Pictish heartland, in recent years new research is reveavaluating the importance of the northern picts, north of the Mounth. Two highland burial sites which feature impressive upstanding remains are to be found on opposite sides of Loch Ness; at Garbeg near Drumnadrochit, and at Whitebridge in Stratherrick. Pictish funerary practices appear to have been diverse (see our earlier blog post), however barrow* cemeteries have been identified as one recognisable form. Round and square type ditched barrows appear alongside each other at both Garbeg and Whitebridge – a feature thought to be unique to the Pictish cemetery. Side by side comparison of a plan of part of the Garbeg cemetery and a quadcopter aerial photo by Alan Thompson. (The brown patches on the photo are the result of recent gorse clearance, and dark green areas are piles of cut vegetation.) The barrows excavated by Wedderburn and Grime on this plan are nos 1,2,3 and 8. Garbeg and Whitebridge were visited by NOSAS field trips in 2014/ 2015 and Garbeg has also been the subject of gorse clearance, quadcopter photography (blog post section 4) and QGIS survey by the group. 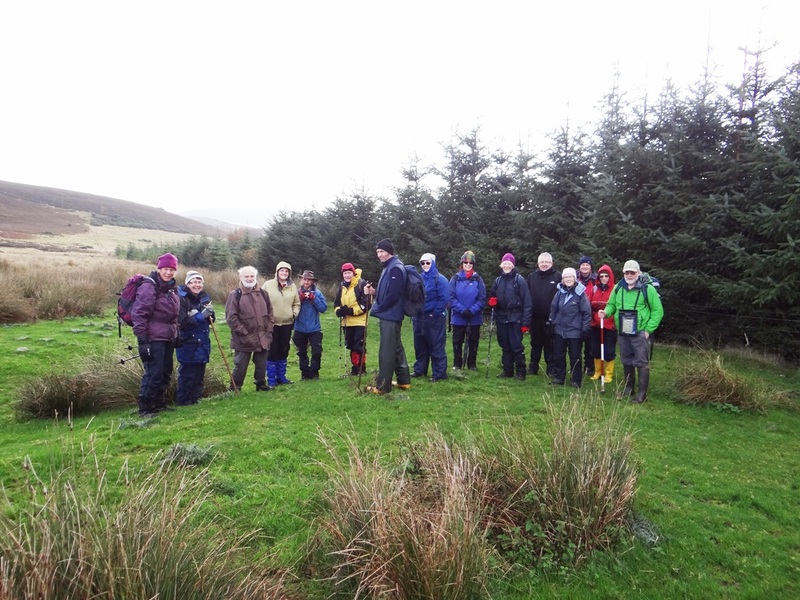 Subsequently in 2015 many NOSAS members were involved with survey and excavation by the University of Aberdeen’s Northern Picts Project on possibly contemporaneous building remains at Garbeg. The cemetery at Garbeg (Canmore ID 12281, HER MHG3361) consists of 23 square and round barrows with surrounding ditches. The barrows are thought to cover single long cist burials. They are situated on a natural plateau at an altitude of some 300m on open moorland used for rough grazing. The immediately surrounding landscape is one rich in archaeological remains, including prehistoric field systems, groups of hut circles and a series of burnt mounds which are largely thought to predate the Pictish period. This entry was posted in General Archaeology, Loch Ness, Aird and Inverness, Pictish and tagged ackergill, Adrian Maldonado, Archaeological dig, archaeology highlands, barrow causeways, barrow cemetery, Brin, brin nursery, c14 radiocarbon results, crop marks, Drumnadrochit, dunrobin, early medieval archaeology, Garbeg, highland archaeology, human remains, inverness shire archaeology, Joanna Close-Brooks, Kate Britton, loch ness archaeology, long cist burial, North of Scotland Archaeological Society, Northern Picts, NOSAS, NOSAS field trip, P J Ashmore, penannular ditch, Pictish, Pictish buildings, Pictish burial, pictish cemetery, pictish drumnadrochit, pictish linear burials, pictish loch ness, pictish standing stone, pictish symbol stone, picts, pityoulish, quadcopter, radiocarbon dates, RCAHMS, round and square barrows, ScARF, square barrows with corner stones, Square ditched barrows, symbol stone and cemetery, Wedderburn and Grime, Whitebridge on February 18, 2016 by nosas. During a recent NOSAS field trip to archaeological sites on the east of Loch Ness, our attention was drawn to the Roman Catholic Chapel near Whitebridge (NH 49496 17045 – HER ID MHG47419) which is situated close to the Pictish Cemetery there (see separate Blog Post). The architectural style is deceptively simple, suggesting an earlier building date than was actually the case, and perhaps also reflecting a continuity with the croft buildings which must have preceded it. The following is the result of my research into the history of the site and its architecture. By the middle of the 19th Century there was perceived a need for a chapel to serve the small number of Roman Catholics who lived in Stratherrick. Lord Lovat offered a site for this purpose at the croft at Bridge of Loin and a collection, which raised £49, was undertaken to pay for the new building. Alexander McDonell, a native of Fort Augustus, who had recently returned to Scotland from Australia, contributed a further £391 and in March 1859 there was a call for estimates from masons, carpenters, slaters, plasterers and plumbers for work on the new Roman Catholic Chapel and Clergyman’s House to be built at Dalcraig (Dalcrag) in Stratherrick. The chapel, seating 130, was consecrated in December 1859 and dedicated to the Immaculate Conception. At a time when other denominations in Stratherrick were building substantial churches in a traditional style and in prominent positions, the Roman Catholic church at Whitebridge is simple, rather modest and set back from the road, so that it is not immediately obvious to passing traffic. 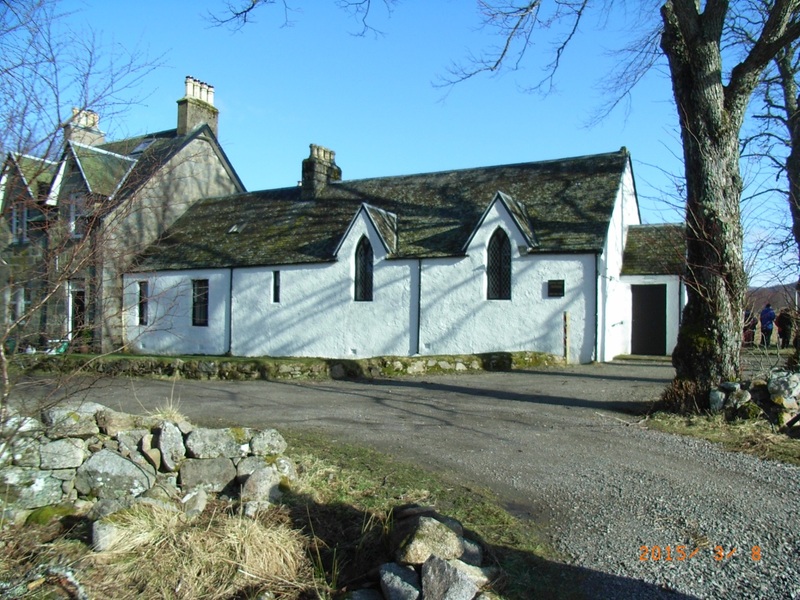 It is a single storey building which resembles a croft house. The door is in the west gable and only the lancet windows betray its religious purpose. At the east end there appears to be domestic quarters and this may have been the original clergyman’s house which was superseded by a more substantial dwelling house at a later date. In A Country called Stratherrick Alan Lawson suggests that this larger house was built around 1900. However, although the two buildings are very different in style, the 1st edition 6” OS map shows the footprint of a building which is very like the present one in its entirety so it’s more likely that they were designed and built together. This entry was posted in General Archaeology, Loch Ness, Aird and Inverness, Post Medieval and tagged A Country called Stratherrick, Alexander McDonnell, archaeology highlands, architectural archaeology, Bridge of Loin, catholics highlands, church history highlands, Dalcrag, Dalcraig, glenmoriston chapel, highland archaeology, highland church architecture, Lord Lovat, North of Scotland Archaeological Society, NOSAS, pictish cemetery, roman catholics stratherrick, Ruskich Inn, stratherrick, Whitebridge on April 2, 2015 by nosas. I’ve had my Quadcopter for over a year now, had great fun flying it, and have produced many interesting images. I recently showed a selection of images at a NOSAS evening, and was asked if I would write this blog and share some of the things I’ve learned along the way. Of course the pictures are what it’s all about and even if you’re not interested in my comments, I hope you enjoy looking at them. Inspired by some of the wonderful aerial photos (APs) I’ve seen (for example on Canmore) I have long thought how good it would be to be able to take such pictures of our own archaeological sites. For several years I have been interested in photogrammetry and experimented with that, especially of rock art where the production of a 3D surface and use of computer generated lighting and shadows can give some great effects. In 2013 I began to investigate kite aerial photography (KAP) but the possibility of using a Quadcopter also emerged and I realised that technology and prices were moving so quickly that it might be a better option. In early 2014 I decided that the only way to learn was to buy one. Most amateur Quadcopters are sold with very wide angle cameras, with the intention of video recording, and also providing a pilot’s view (called first person view or FPV). This is less than satisfactory for archaeological aerial photography, and so I bought a Quadcopter without a camera, with a view to fitting my own. The camera is obviously critical, and it needed to be light (ideally <300g including battery), robust, of good enough quality, and with an interval timer. Unfortunately I could find no such camera. All those with interval timers are heavier, for example those used for kite aerial photography. A solution can however be found in that a group of people spend their time hacking the software of Canon cameras (google CHDK) and provide a hacked version for some models which enables an interval timer to be run. 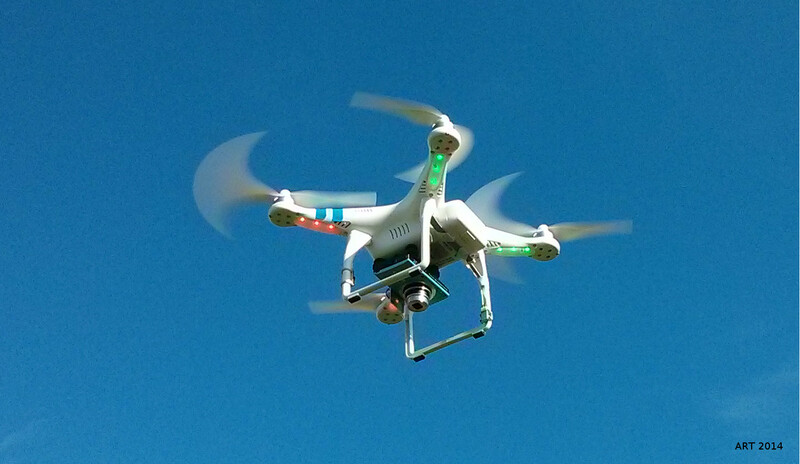 Having bought and hacked my camera and got the interval timer working I had to fit it to the Quadcopter. The main problem is the high frequency vibration from the rotors which renders the pictures useless. A suitable anti-vibration mounting was needed, all within the weight limit. Next, to prepare for the first test flight. The web (YouTube) is full of videos of alarming crashes and fly-aways. The Quadcopter instructions are daunting saying that a first flight should be from the middle of a large field, with no wind and no people about. There is also the matter of insurance (it could certainly hurt someone badly), and the possible need for a CAA licence. The regulations here are changing quickly but at present as a hobby flier I can insure through the British Model Flying Association (BMFA), and (unlike a professional archaeologist) have no need of a CAA licence provided I fly within line of sight, avoid certain areas (eg near airports) and limit the height. I would again emphasise that this is all very much in the news and changing and my observations here will quickly be out of date. The first flight is bit nerve-racking, but set to auto mode the Quadcopter uses its own GPS and compass and is set so that (more or less) if you let go of the controls it just hovers where it is. Flying in this mode is reasonably straightforward. I have not dared try any of the advanced modes as yet. This entry was posted in General Archaeology, Surveying and Recording and tagged aerial photography, Archaeological dig, archaeology highlands, archaeology Scotland, Banchor, belladrum, Bronze Age Archaeology, Drone, Fraser Hunter, Garbeg, highland archaeology, hut circles, Iron Age Dun, iron age roundhouse, North of Scotland Archaeological Society, NOSAS, pictish cemetery, quadcopter, recording and surveying, scotsburn, Scottish archaeology, surveying a village on March 28, 2015 by nosas. (See also separate post about Garbeg and Whitebridge cemeteries). The Picts, those most elusive of early medieval Scottish peoples, seem to have disposed of their dead in a variety of ways. Remains that can still be found in the landscape include cremations, simple burials in the ground, long cist burials, burials under cairns, and burials under round and square barrows. It is also probably true that disposal was achieved by exposure and excarnation – practices continuing from pre-history. What remains unclear is how any of these contemporaneous burial practices were chosen for a specific individual or group. This entry was posted in General Archaeology, Pictish and tagged Adrian Maldonado, aerial photography, archaeology, archaeology Scotland, burial cairn, burial cist, early medieval archaeology, excarnation, first millennium, Forteviot, Garbeg, grave goods, highland archaeology, human remains, North of Scotland Archaeological Society, NOSAS, Pictish, pictish barrow, Pictish burial, pictish cemetery, picts, quadcopter, radiocarbon dates, RCAHMS, rhynie, rhynie aberdeenshire, round barrow, Scottish archaeology, square barrow, test pits, Whitebridge on October 12, 2014 by nosas.